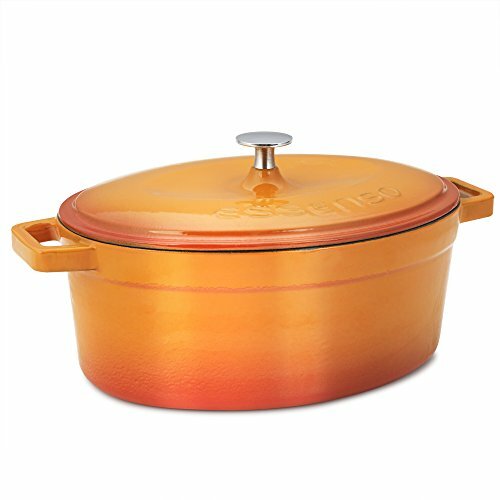 Cast-iron dutch oven with beautiful orange glaze. Great for stock, stews, braises – slow cooking and hearty meals! 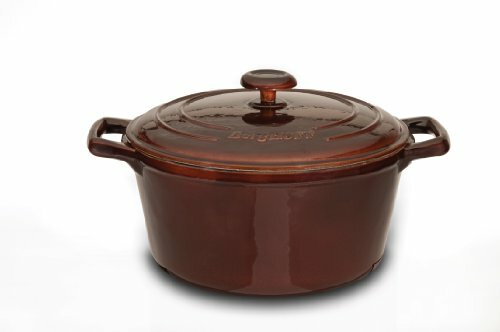 In addition to cast iron’s superior heat retention and even heat distribution properties, Essenso’s 3-layer enameled cast iron dutch oven doesn’t require seasoning, its impermeable surface can be used with acidic foods and wine, and it’s resistant to cracking and rusting. Easily tolerates up to 500F in the oven. Smooth surface is more user friendly with glass stoves than traditional cast iron cookware. Good food release properties when lightly lined with cooking oil and used on medium-low heat. Promotes easier to clean, healthier, residue-free cast-iron cooking. If preheated on low-medium heat, cast iron doesn’t require higher heats that lead to food sticking and burning. A beautiful piece to present on the table straight out of the oven or off the stove. Cast iron heat retaining properties will keep food hot on the table. 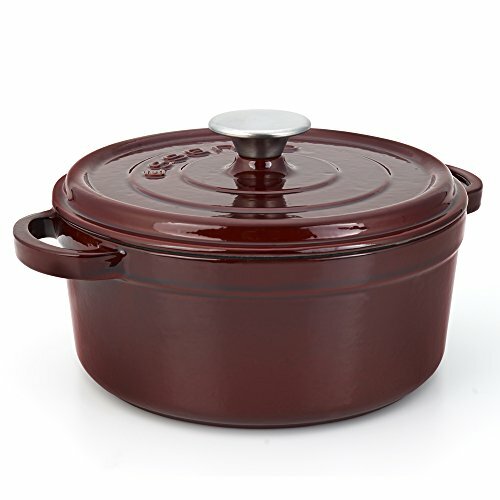 Great for cooking lamb ragu, braised short ribs, chicken stock, bread and other great one-pot, hearty meals! Made in Turkey. Limited Lifetime Warranty. 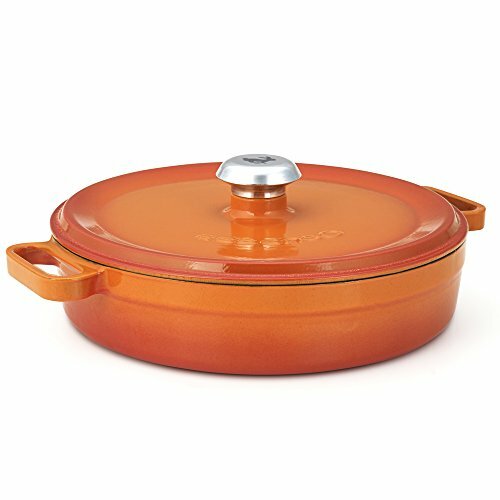 Cast-iron dutch oven with beautiful orange glaze. Great for soups, stock, stews, braises – slow cooking and hearty meals! 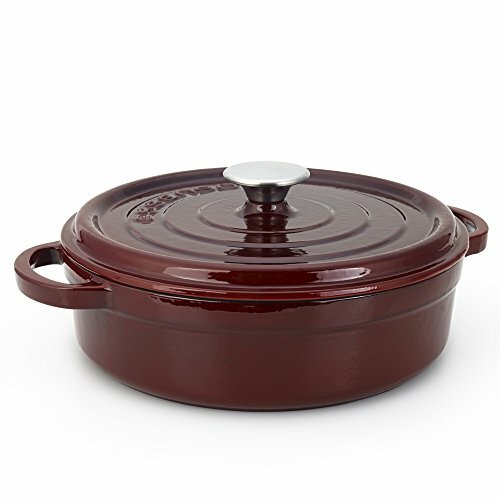 In addition to cast iron’s superior heat retention and even heat distribution properties, Essenso’s 3-layer enameled cast iron dutch oven doesn’t require seasoning, its impermeable surface can be used with acidic foods and wine, and it’s resistant to cracking and rusting. Easily tolerates up to 500F in the oven. Smooth surface is more user friendly with glass stoves than traditional cast iron cookware. Good food release properties when lightly lined with cooking oil and used on medium-low heat. Promotes easier to clean, healthier, residue-free cast-iron cooking. If preheated on low-medium heat, cast iron doesn’t require higher heats that lead to food sticking and burning. A beautiful piece to present on the table straight out of the oven or off the stove. Cast iron heat retaining properties will keep food hot on the table. Great for cooking lamb ragu, braised short ribs, chicken stock, bread and other great one-pot, hearty meals! Made in Turkey. Limited Lifetime Warranty. 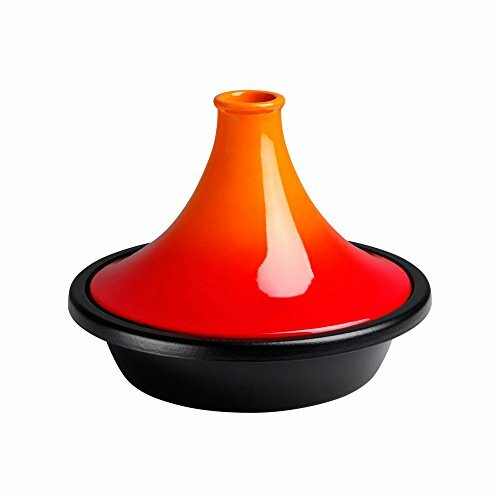 The Moroccan tagine is the traditional cooking vessel of the slowly simmered, heavily seasoned cuisines of North Africa. The distinctive cone-shaped lid promotes natural steam circulation to keep beef, lamb and other meats perfectly tender and exceptionally flavorful. 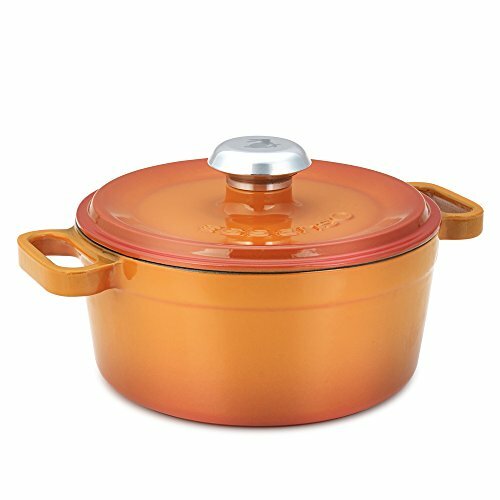 And because it's crafted of durable cast iron, the base cooks food evenly and retains heat longer. 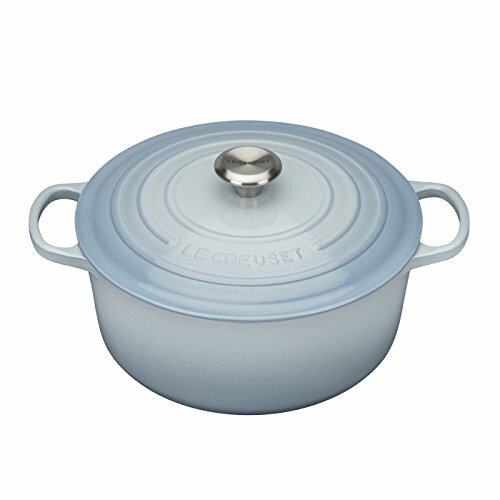 Looking for more Enameled Italian Kitchen Dutch Oven similar ideas? Try to explore these searches: Bamboo Silk Fabric, Tropic Multi Ocean Stripes Rug, and Rose Rice Bowl. Look at latest related video about Enameled Italian Kitchen Dutch Oven. Shopwizion.com is the smartest way for online shopping: compare prices of leading online shops for best deals around the web. 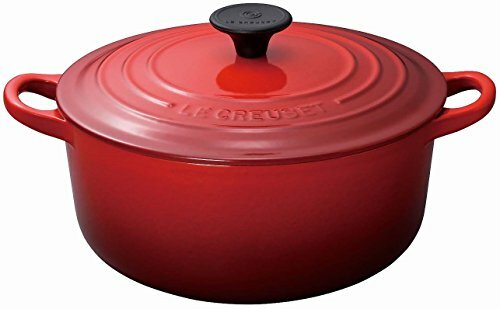 Don't miss TOP Enameled Italian Kitchen Dutch Oven deals, updated daily.